Sunday School, meets Sunday at 9:15am. We have a class for kids age 4-K and a class for kids grades 1-6. *Family Worship Service is the 1st Sunday of each month. There is no Kids Church – families are encouraged to worship together in the service. Sunday School, meets Sunday at 9:15am. 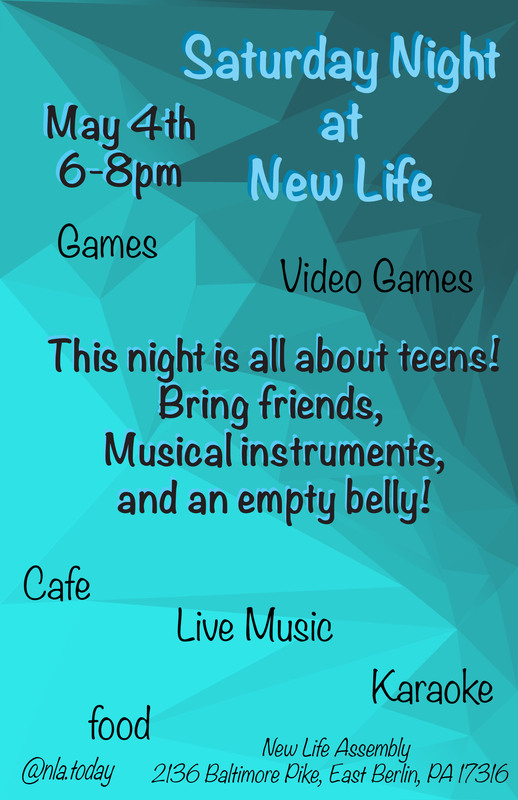 Saturday Night at New Life, meets once a month. The next event is Saturday, May 4 from 6pm-8pm. Planned by teens for teens! Expect Video games, Food, Basketball, Board Games, Karaoke, & Music. Bring your friends! Prayer Team, meets Sunday at 7am for prayer, and Saturday at Morning Star Marketplace (Thomasville, PA) for outreach opportunities. Sunday School Small Groups, meets Sunday at 9:15am: Life Stages led by Ryan Dusharm, The Constitution led by Wayne Esbenshade, Church Outreach led by Stan Jett, Sermon Discussion led by Ray Mummert & Stephanie Saenmuengma, & Conversation & Egg Sandwiches led by Sam Marquet. Women’s Ministry, meets second Tuesday of the month at 9am for Bible study, and as events are scheduled throughout the year. Attends Women’s Conferences in November (Created For This 2019). Men’s Ministry, meets second Saturday of the month at 8am for breakfast in the gym, and as events are scheduled throughout the year. Attends Men’s Conference & in October (Courage 2019). Stephen’s Legacy, (benevolence committee) meets as needed to consider financial & support requests, and to serve those going through crises or hardships. Meets quarterly to serve dinner at Harmony Personal Care Home. Forever Young (adults age 40+), meets as events are scheduled. Ruth’s Harvest is a weekend food program, in partnership with other local churches, that benefits 125 kids in the Bermudian Springs School District who don’t have enough food at home. We are currently accepting single-serving size packages of shelf-safe milk, cereal, & ravioli. Donations may be dropped off in the main lobby.